The combined attendance of the Washington D.C. Women’s March and its sister marches around the country and globe far outnumbered that of Donald Trump’s inauguration. The only question is by how much. While speaking to CIA employees on Saturday, President Donald Trump said that the crowd that attended his inauguration at the Washington Mall “looked like a million, a million and a half people.” No one outside his team has offered such a large estimate. Trump’s team is already complaining that the news media misrepresented the number of inauguration attendees, and quibbling with the framing of some news photos. So it might be best to rely on neutral sources like the ones we’ll cite below, or aerial photographs that speak for themselves. The number counted on the Metro Friday is roughly the same amount that used morning public transit for George W. Bush’s second inauguration in 2005. By comparison, Metro reported 517,000 for Barack Obama’s 2009 inauguration and 317,000 in 2013. Women’s March organizers estimate that approximately 500,000 people gathered at the Washington Mall on Saturday. Prior to the inauguration, officials had estimated that between 700,000 and 900,000 would gather to see Trump’s swearing-in. But pictures on social media comparing the crowds on Friday and Saturday show that the gathering on the main stretch of the Washington Mall was larger than that of the inauguration. Videos taken by reporters also showed that large swaths of the bleachers set up for the parade which followed the inauguration were mostly empty. 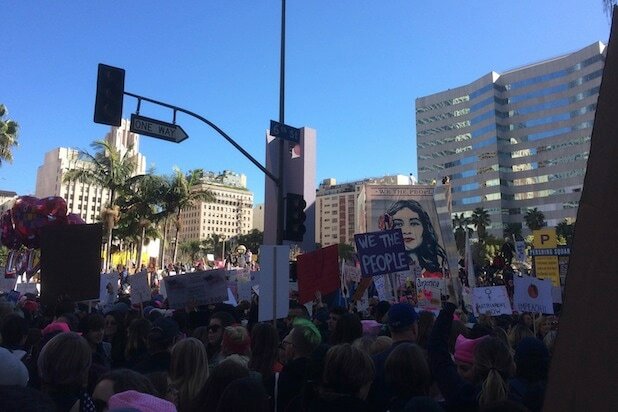 It should be also noted that the streets surrounding the Mall, which were cordoned off during the inauguration, were open for Women’s March attendees to march through. Also, the west end of the Capitol Building, which was at capacity when Trump made his inauguration speech, was not accessible during the Women’s March. There is no definitive attendance rate for the inauguration at this time. The National Park Service, which manages the Washington Mall, stopped providing attendance for events at Washington D.C. monuments in 1995. 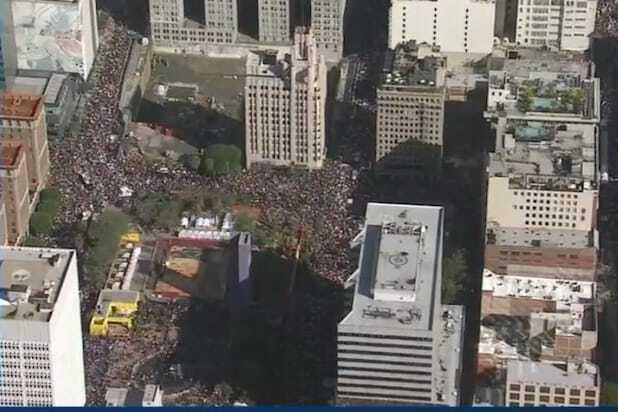 But a possibly even larger Women’s March crowd gathered in downtown Los Angeles. The LAPD estimated that more than 100,000 attended, but stopped counting at that point. Organizers reported approximately 750,000, which far exceeded organizers’ expectations for 150,000 protesters. LAPD also reports that no arrests were made at the march. NBC Chicago said 250,000 people – three times as many as expected — turned out on an unseasonably nice day for the demonstration, forcing the cancellation of a planned march. Attendance in New York City was more than 400,000, according to Mayor Bill de Blasio’s office. The St. Paul [Minnesota] police issued an official crowd count of 50,000 to 60,000 people. Attendance in Boston was 175,000, according to Nicole Caravella, a spokeswoman for Mayor Martin J. Walsh. The Atlanta Police Department estimated about 60,000 people attended a rally there. The Department of Public Safety in Phoenix estimated that some 20,000 marched, while in Key West, Fla., a town of 25,000, police said more than 2,000 people marched. And that was just in major U.S. cities. Organizers also expected sister marches in cities around the world.